Mattia's main project in which he is involved is the Mobile Territorial Lab (MTL), which aims at creating an experimental environment to push forward the research on human-behavior analysis and interaction studies of people while in mobility. MTL has been created by Telecom Italia SKIL Lab, in cooperation with Telefonica I+D, the Human Dynamics group at MIT Media Lab, the Institute for Data Driven Design (ID³) and Fondazione Bruno Kessler, and with contributions from Telecom Italia Future Center. Inside this project, he takes part at the design and conduction of research activities and developeds different pieces of software (web services and mobile applications). 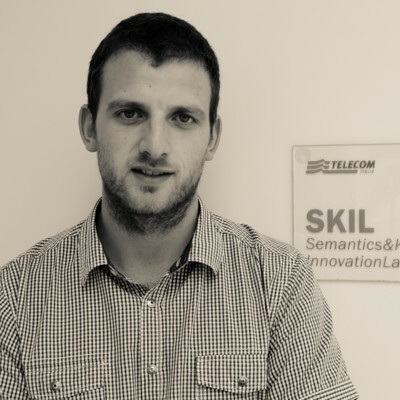 Before starting his working career, Mattia got a Bachelor and Master degrees in Computer Science at the University of Trento. He chose the Software Technologies field that allowed him to focus on software engineering, programming and human-computer interaction.